It’s November 2017, and it’s time to introduce our new Historical Theme of the Month at Gazette665: Thanksgiving Through The Decades. I’ve collected four primary source excerpts about Thanksgiving celebrations in different eras of American History and will be sharing them every Friday this month. What better decade to start than the 1620’s? After-all, in 1621, the colonists at New Plymouth settlement had a harvest celebration that has been dubbed “the first Thanksgiving” (even though there were thankful harvest gatherings in plenty of other cultures and locations in World History!). They began now to gather in the small harvest they had, and to fit up their houses and dwelling against winter, being all well recovered in health and strength and had all things in good plenty. For as some were thus employed in affairs abroad, others were exercised in fishing, about cod and bass and other fish, of which they took good store, of which every family had their portion. All the summer there was no want; and now began to come in store of fowl, as winter approached, of which this place did abound when they came first (but afterward decreased by degrees). And besides waterfowl there was great store of wild turkeys, of which they took many, besides venison, etc. Besides, they had about a peck a meal a week to a person, or now since harvest, Indian corn to that proportion. Which made many afterwards write so largely of their plenty here to their friends in England, which were not feigned but true reports. In autumn 1621, William Bradford was governor of New Plymouth, and his recollections about the harvest season that year focus on the abundance of game and crops. It was a wonderful contrast to the harvests and food supply in Europe where these settlers had struggled to make a living or had refugeed to Holland to escape religious persecution. The abundance of food was almost overwhelming to these settlers, and Bradford gave the details. And God be praised, we had a good increase….Our harvest being gotten in, our governor sent four men on fowling that so we might after a special manner rejoice together after we had gathered the fruit of our labors. They four in one day killed as much fowl as, with a little help beside, served the company almost a week. At which time, amongst other recreations, we excercised [exercised] our arms, many of the Indians coming amongst us, and among the rest their greatest king Massasoit, with some ninety men, who for three days we entertained and feasted, and they went out and killed five deer, which they brought to the plantation and bestowed on our governor, and upon the captain and others. And although it be not always so plentiful as it was at this time with us, yet by the goodness of God, we are so far from want that we often wish you partakers in our plenty. 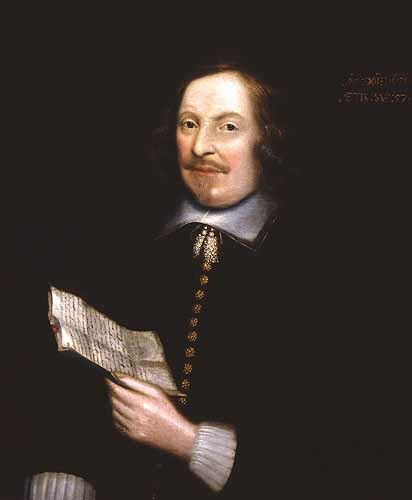 Edward Winslow was a leader in the Separatist group. The Separatists were a group among those we call “The Pilgrims” who were fleeing religious persecution. He lived in Holland from 1617-1620, and he helped organize the voyage to the New World. 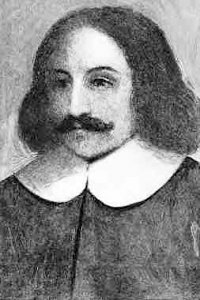 Edward Winslow helped William Bradford with colony administration and eventually served as Governor of Plymouth Colony. William Bradford’s record of the harvest and Edward Winslow’s account of the celebration are a foundation for our understanding of the “First Thanksgiving.” Perhaps the details aren’t all that we’d like to know about the event, but they give us a foundation to explore. 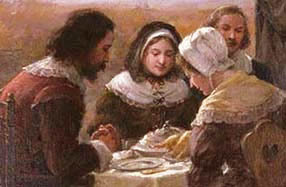 Taking these primary sources and learning from other historical accounts, English societal norms, the Separatists’ religious beliefs, and the cultures and customs in the New World, historians have been able to discover more about probable details surrounding the 1621 Thanksgiving. Why is it important to look at the known, recorded facts from 1621? Well, the harvest celebration, the Separatists & Strangers, and the ninety Wampanoag warriors gets idealized and romanticized into a pretty legend with Pilgrims, “Indians,” and a First Thanksgiving Feast – complete with a roast turkey and stuffing in the painting. I think it’s important to peel away the layers of idealism and seek a better understand of the early settlers at Plymouth. Sure, the historiography of Thanksgiving idealize is interesting, but for a little while every November, I like to think about the real details that started the Thanksgiving stories. And I’m grateful for Bradford and Winslow’s short narratives that give us insight into those three days of comradeship, thanksgiving, and celebration.